This year marks the 30th anniversary of Freddy Krueger’s arrival on the scene, and you better believe that we’re going to be celebrating his birth here on Halloween Love, throughout the year. The festivities kicked off with a look at Wes Craven’s New Nightmare, which itself turned 20 this year, and continued with a post where I desperately tried to find the good in a particularly bad movie; 2010’s Nightmare on Elm Street remake. Freddy Krueger has made his presence known on all forms of media over the years, from comic books to a video game, the big screen to the small screen. 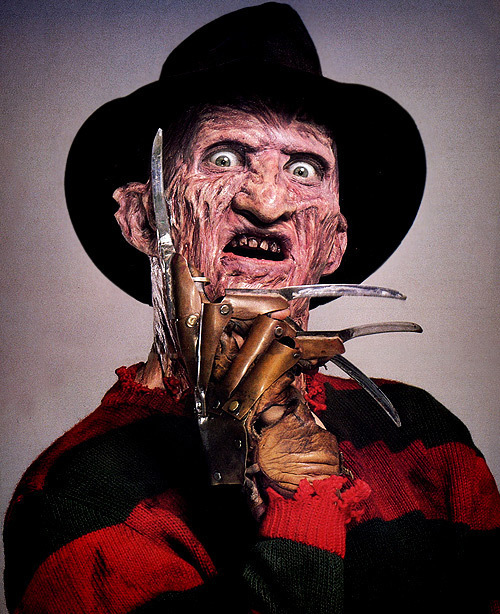 After a handful of big screen sequels, the burnt up dream demon arrived on the small screen in the form of Freddy’s Nightmares, a spin-off anthology series that aired from 1988 to 1990, and was comprised of 44 episodes. The show was Freddy’s first and only television venture, right? Well. Yes and no. Back in 2005, two years after finally engaging in an epic battle with fellow slasher icon Jason Voorhees, Freddy was set to star in his very own reality show, courtesy of CBS. Titled A Nightmare on Elm Street: Real Nightmares, the idea behind the show was to force contestants to face down their most terrifying nightmares, and the host was none other than Robert Englund, who of course played Freddy in all of the original Elm Street films. Described as “a groundbreaking new reality series,” the saga of Real Nightmares began when CBS posted a casting call online for the show, which asked fans to send in videotaped auditions, so to speak, vividly describing frightening nightmares that kept them awake at night. As the casting call described, each episode was going to center around three separate contestants, who would each confront those nightmares, with Englund serving as a “dark guide for the dreamers,” to help them in their quest for a restful night’s sleep. Though that internet casting call is the greatest source of information about the failed project, you might be surprised to learn that several episodes of the show were actually shot, before being filed away on a shelf somewhere. From what I’ve heard over the years, up to six episodes were filmed at the tail end of 2004, one of them featuring a woman confronting her crippling fear of clowns and another contestant finding himself in a maze with a minotaur, in an attempt to overcome his fear of bulls. Real Nightmares was set to air in early 2005, but CBS pulled the plug, feeling that it was just too similar to NBC’s Fear Factor, which was popular at the time. Nearly ten years later, and not a single second of the show has seen the light of day, on television or even on the internet. The show has seemingly dropped off the face of the earth, quite possibly never to return again. If anyone who was a contestant on the show, or played any part in it, finds their way over to this post, please leave us a comment below, with an e-mail address where you can be contacted. Would love to learn more about the show, and give you a platform to tell stories about your experience with it!